Dedicated Professionals offering today's BEST medicine to their patients. Committed, Experienced, Compassionate, and Comprehensive Endocrinology Care! The professionals here at Arizona Endocrinology Center are pleased to offer today's best medicine to our patients. Our practice includes General Endocrinology, Diabetes treatment, Thyroid disorders, Cholesterol disorders, Hormone imbalance, and Testosterone deficiency. We are committed to providing quality patient care from our dedicated team of health care professionals and staff. By utilizing the latest in medical advances and technology, we offer comprehensive treatments to improve the quality of life for our patients. 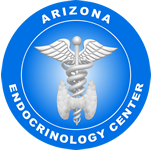 Arizona Endocrinology Center offers the latest technology to provide patients with today's best medicine. If you're a new patient at Arizona Endocrinology Center, please visit our "New Patients" section for information about your visit to our office! At Arizona Endocrinology Center, we are proud to offer state-of-the-art care - thanks to our newly-established laboratory with cutting-edge technology, which includes Vitamin-D deficiency testing.